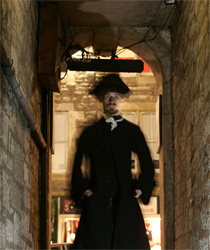 Visitors can experience a spookier alternative to The Real Mary King’s Close between Thursday 27 and Monday 31 October. Supernatural History Tours will explore Edinburgh’s macabre stories of witchcraft and the supernatural as well as investigating some of the reported paranormal activities on the Close, including the revealing of electronic voice recordings! To find out more see our Supernatural History Tours page and to book tickets please visit ourbookings page or call 0845 070 6244.